I just turned 69 and most of my friends go into retirement. I will not. The next decade will be the most exciting, challenging and deadly serious one in the history of sustainability, said John Elkington. Are you preparing your students for this? 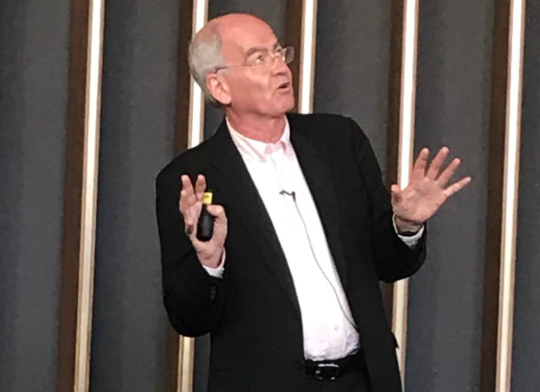 John Elkington was speaking at the Principles of Responsible Management Education (PRME) conference in London about his new article in Harvard Business Review on rethinking the Triple Bottom Line. The conference took place in East London, where 27 percent of university students are from households with less than 10 000 £ annual incomes and where 40 percent are from non-academical family background. The theme was: teaching inclusion in business schools. The host of the conference was the business school at Queen Mary University of London. It is located in the East End, overlooking the skyline of the richer financial center of the city from a distance. Symbolically, the hosting business school’s objectives for the conference were Social Justice, Sustainability and Governance. A number of British universities demonstrated how they engage their business students in projects with excluded groups, as a way of learning more about society, but also as a way of supporting talents from diverse backgrounds. An important lesson for Swedish Universities as well, like in Örebro where the first students of the new master in Sustainable Business will arrive after summer. The conference was all in all a perfect warm up for our coming seminar during the Almedalen fair next week where we will discuss the future of sustainability education with a number of companies. Follow Forever’s Facebook and LinkedIn to keep yourself updated.